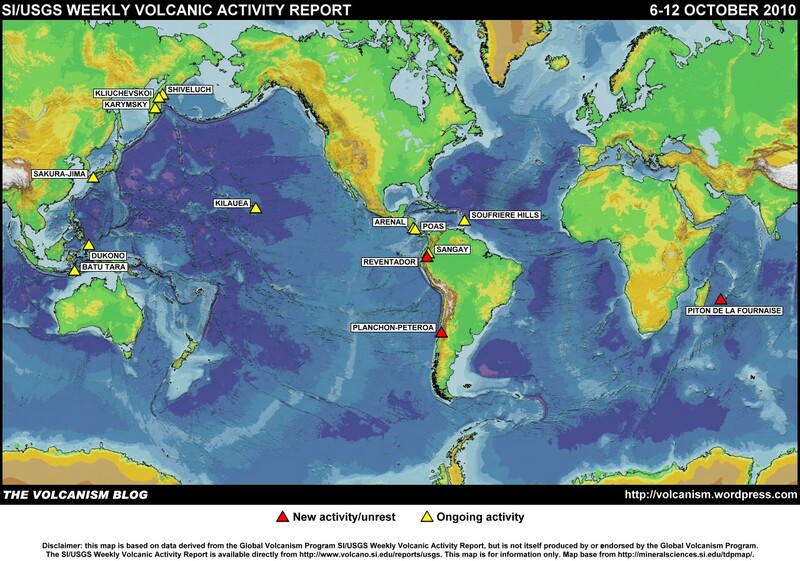 The foregoing is a summary of the Smithsonian Institution/United States Geological Survey Weekly Volcanic Activity Report covering 6-12 October 2010. It is provided for information only, and is based on but not a substitute for the full report, which comes with its own criteria and disclaimers. The map base is derived from the Smithsonian Institution/USGS/US Naval Research Laboratory This Dynamic Planet website. There is an ongoing eruption of Piton de la Founaise since yesterday. Yes, thanks, I saw that Piton de la Fournaise had gone into eruption, rather sooner than we were expecting. I’ll catch up with the news later. Had two close encounters with the dentist this week and haven’t felt much like blogging (or anything else for that matter) as a result. 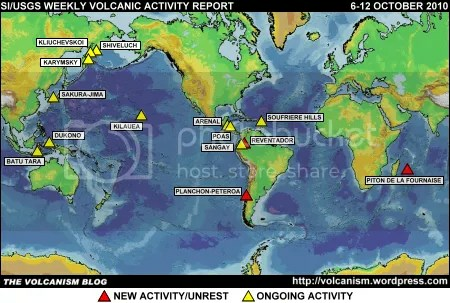 hi .. does anyone can help to understand if all these is under or above the normal activity of the volcanos….